Journal 3 was found, intact in the woods of Oregon. Those who thought the book lost forever along with its secrets can rejoice (or huddle in fear – whichever). 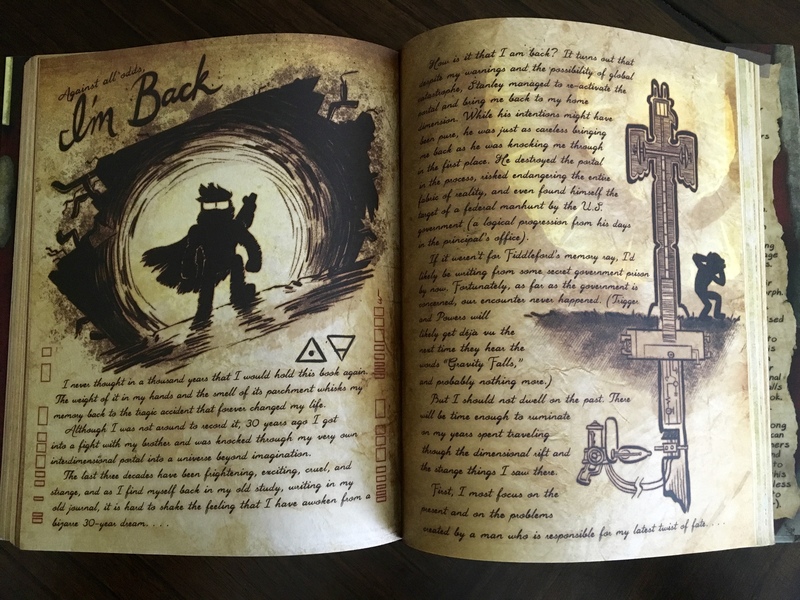 Containing the secrets of the Pines family, this astounding document uncovers the weirdness surrounding the town of Gravity Falls and the final battle between Bill and the town. With journal entries from Stanford Pines along with his nephew Dipper who first retrieved the book and guest entries from his sister Mabel and friend Soos, this tome tells the tale of Gravity Falls through the eyes of the authors. Purchase this book – if you dare. In all seriousness, this book is a fountain of wealth for fans of the show Gravity Falls, one of the most brilliant shows ever written. While directed at the 8-12 group, it contained enough intrigue and mystery for fans of all ages – as does this book. 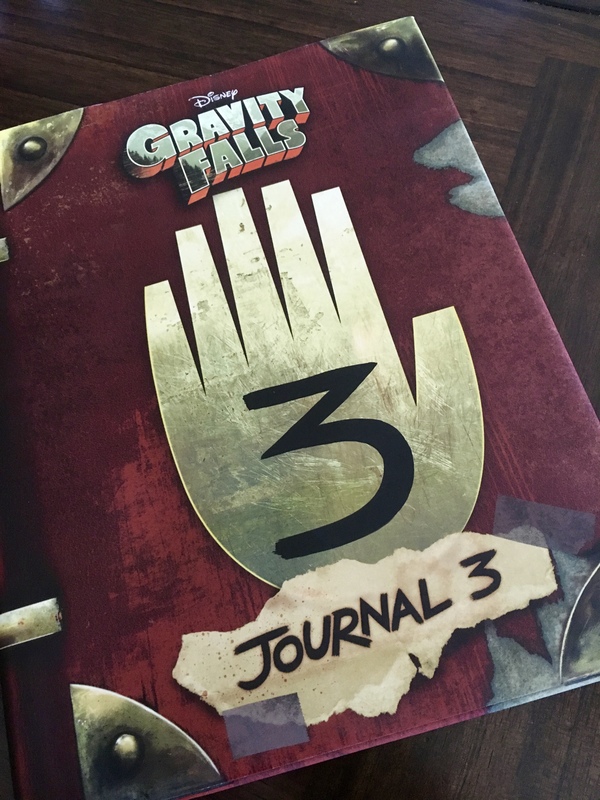 Journal 3 is the book that Dipper found on his first day in the town that fueled his curiosity and the adventures he went on with his sister Mabel and their friends and family. What you hold in your hands is the “actual” third journal complete with notes and a chronological sequence that coincides with the show. The book also goes deeper into the thoughts, hopes, and lives of the characters. More than just an index of weird creatures or an homage to the show, the journal adds depth to what viewers have already seen. The entries embellish upon what the characters were going through during the course of an episode, the aftermath of those episodes, and some additional details about the characters themselves. It also talks about what happened to Stanford Pines in the time he was missing – the places he visited and the weird things he saw. It goes far deeper into his personality and gives readers even more insight into all the weirdness of Gravity Falls. Personally, I love Mabel’s entries. They reflect her bubbly, larger-than-life personality. She uses crayons and multiple colors to express her thoughts and experiences which add a lightness to the book which could easily get caught up in Stanford’s more conspiratorial, sci-fi, and strange adventures. Each of the authors have their own style to make it easy to differentiate between them. While this style has been used in other books, it is done expertly here and with little overlap between character voices. The entries are not only well written (of course co-authored by series creator and overseer, Alex Hirsch, what would you expect), but the illustrations were beautiful and fit the tone and tenor of the series. I love Gravity Falls but am nowhere near a series aficionado as some fans out there. There are symbols scattered throughout the book but they don’t seem to match up to any of the cypher codes fans have shared online. Is this a new cypher or am I just unable to crack it? I am constantly amazed at the intricacies that Alex Hirsch has put into his series and more impressed that despite its popularity, he ended it because the story had been complete. Thankfully, there are still nuggets like this still out there in the world to continue the tradition. Oh, and by the way, the dust jacket of the book is also a secret poster. How cool! Keep the Falls alive! Hi, I also bought a book! Not on Amazon but in Fullybooked store. After removing the top cover. The print is a little off at the bottom. The edge of the arc should be touching the bottom but it’s not. There is an excess. I notice your picture (even though it was bought from amazon) your book also has the same “off” print? So I’m wondering if all journal book 3 sold at amazon/fullybooked has the same one? That’s a great question. I don’t really know but I’m betting it was printed like that on purpose. The book is supposed to mimic a real journal – flaws and all – so I wouldn’t be surprised.